Guess Who? 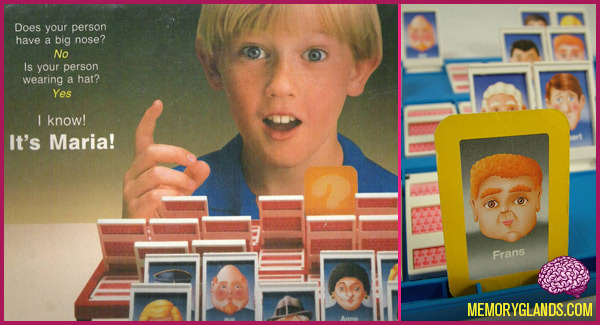 is a two-player guessing game created by Ron Johnson, first manufactured by Milton Bradley in 1979 in Great Britain. It was brought to the United States in 1982. Early versions included fewer women than men; the 1987 edition featured only 5 women compared to 19 men. In the mid-1990s, the faces were changed and the sexes were made more even. Special editions which have different faces have been released, including Star Wars, Marvel Comics and Disney. There are smaller, “travel” editions which have only 20 different faces.